In our Hispanic parishes, twelve of the youth are dressed in apostolic robes as they come forward to have their feet washed. At Marylake, it has always been "a tough sell" to find more than three or four willing to take off their shoes for the foot washing. One duty of the sacristan is to see to it that the water is warm so the willing volunteer doesn't flinch as the priest pours it on his foot. This evening we return to capture a bit of the flavor of that original last meal Jesus shared with his chosen Twelve. For Jesus it was a time of deep feelings, a night of profound emotion. He had chosen these twelve men very carefully, and after much prayer. They had been his companions through the good times and bad. They were the ones to whom he had opened his heart. It was to them that he revealed his innermost thoughts. This evening's meal is tinged with sadness. It is a time of transition. The nature of the celebration itself was a rite of passage, as Jesus recalled how his people passed over from a familiar land to an unknown one. It was a relaxing evening for the twelve friends of Jesus. Jesus made sure his own preoccupations did not interfere with the mood of the celebration. The small group reclined after the meal and John rested his head upon Jesus. Peter had drunk too much, and James and John as well. This will be shown by their hasty words, abrupt behavior, and slow reactions later on that night. But for the present, there were no words of reprimand, no tensions raised to spoil the mood. There was a poignancy in the air, however, as Jesus took off his festive cloak, stripped down as a waiter, and began to wash the feet of those whom he loved. Jesus ministered to them who came to minister to him. You must wash each other's feet... as I have washed yours. Intimacy with Jesus entails serving his servants. Jesus knew this was the time of his passing. He was preoccupied with poignant thoughts of one friend who would deny him, of another who would betray him, of three who would fall asleep at the moment when he needed their support the most. There would be blood. 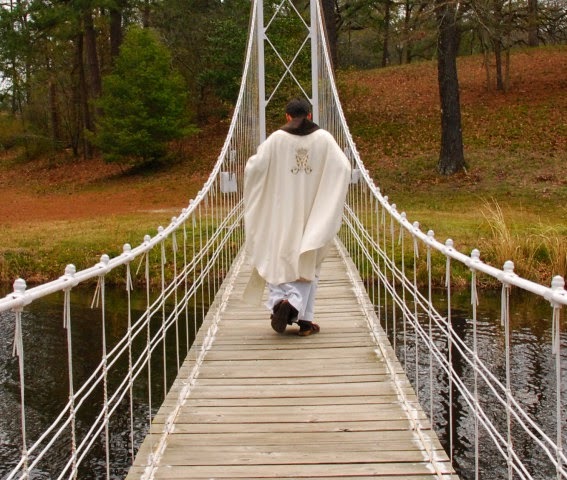 On Good Friday at Marylake we find time to take a walk over the bridge that separates the monastery (the land of the living) from our provincial cemetery (the land of the dead), located on the 9th hole of an old golf course.